This morning was a six o’clock wake up to the trainees’ surprise. We hoisted anchor and followed the radar out of deep water cove. By the time we exited the cove the sun was coming over the horizon and the trainees came up stairs single-handedly one by one and sleepy eyed to enjoy hot chocolates. Although the hot chocolates didn’t last long as shortly after some of the trainees enjoyed the usual amount of sea sickness the tucker has to offer. We set a course for the Motu Kokokako the Hole in the Rock and while some of the trainees went down stairs others enjoyed tiny glimpses of the sunrise through the large amount of clouds in the way. Unfortunately the moderate easterly swell made it unsafe for us to take the trainees through the hole in the rock in the tender, but it made for some wonderful photographs as the waves hit the rocks in showers of spray. We had thought of sailing south, towards Whangamumu, but the changing forecast and the swell persuaded us otherwise so we headed back into the Bay, eventually setting the Upper and Lower Topsails to go with the Main, Mizzen, and headsails already set. Tamatu, Niamh, and Ahi helped steer, as others gradually recovered from their seasickness and a lovely steady breeze set in. We used it to introduce the trainees to gybing the ship with most sails up, and anchored in Waiiti Bay for lunch. 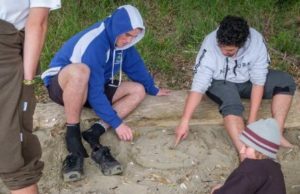 Heading ashore, Connor, T-J, and Ahi proved very proficient at Moturere, a traditional maori game using stones and shells that once Nga Puhi chiefs challenged the Governor with, the stakes being all of Aotearoa New Zealand! TJ, Ahi and Hadyn then lasted the distance during a game of Ki Te, a knockout game where participants are blindfolded and have to touch the others knees… Very funny to watch. Back to Tucker to move to Orokawa Bay to avoid some rain which we can see bearing down on us on the rain radar, and we are now at anchor safe and sound, trainees enjoying some free time whilst dinner is cooking—yum! Pai te po from Tucker!